After Hurricane Katrina, Skip Henderson met her friend Dave Dominici who just bought a music drum. It was spotted by flood waters. But Dominici offered something else to Henderson: a desk lamp. Henderson immediately recognized from the shape that the lamp was not made in America. He asked what the lamp was made of. Dominici replied, "The skin of the Jews." Henderson was instantly interested and bought the lamp. He took it to an expert who said, "This beast less animal has no hair." From that moment on, the object haunted his mind. Henderson then took the initiative to contact his friend named Mark Jacobson. He received a call from Henderson telling him about the lamp. "But that's not my problem anymore," said Henderson. "I sent it to you last night." The horrible story of an object made from human body parts is nothing unfamiliar to Jacobson. As a Jew, he had heard many stories of torture at the Concentration Camp during Nazi Germany's lead. But of the many stories, which may be related is the brutal Kamp in Buchenwald. As the Independent's daily said, nine days after Buchenwald was freed by the allied forces, United Press International correspondent Ann Stringer looked at the sheet used as a lampshade. Its diameter is 2 feet. Height 18 inches. The sheet consists of 5 pieces put together. Stringer believed that the sheet was made of human skin. "I can see the pores." The terrible thing was found at the home of Ilse Koch, wife of the commander of the Nazi SS, Col. Karl Otto Koch. By the prisoners, Ilse Koch was nicknamed "Witch of Buchenwald". Based on the available information, Ilse Koch selects prisoners whose skin is tattooed to be killed by his lover, Dr. Walmer Hoven. The skin is later used to make lamps as home decoration. To check the truth of the link between the light that is now in his hand with the Buchenwald story, Jacobson meets with Diane Saltzman, a staff member at the United States Holocaust Memorial Museum. Said Saltzman, for 50 years there is no lampshade that proved really derived from Buchenwald. 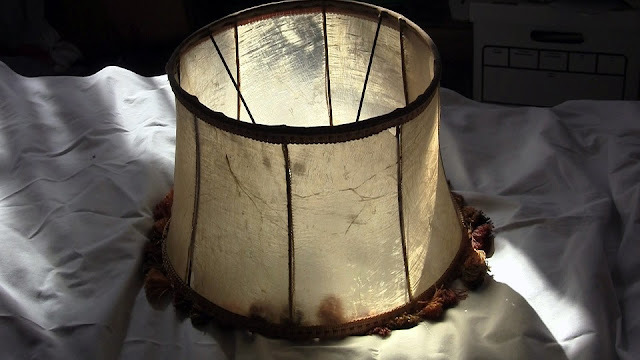 DNA tests may show the lampshade is actually made of human skin, but it does not show it comes from Buchenwald or from a Jewish skin. In addition, in the museum, there is also a photo of Kamp Buchenwald and objects made of human body parts. One of them is the lamp. But the shape of the lamp that Jacobson has is different from the lights on the photo. Not satisfied with the answer. Jacobson went to El Paso, Texas, to meet Albert G. Rosenberg. Rosenberg was once the commander of the elite army who entered Buchenwald first. At that time he was writing a report on the table. A French prisoner approached him and shouted that Rosenberg was no better than the Germans. It was only then that Rosenberg realized that the lampshade he had lit during writing was made from human skin. Rosenberg adds that he keeps a piece of tattooed skin that he got at Buchenwald. The skin is used as a hat material used by a woman. But things like that, Rosenberg says, have an "uncomfortable" effect on their owners. Jacobson had been advised by Michael Berenbaum, a Holocaust expert, to stay away from the lampshade. "Being near such things, thinking about them, can drive people crazy. I will stay away from it as much as I can. "Berenbaum also claimed to have carried a toxic gas cylinder that had been used by Nazi special forces. The presence of the gas cylinder was in his garage, Berenbaum said, "Enough to send me to psychotherapy." Sure enough, Jacobson's mind was filled with images of the victim and how the lampshade was made. Horrifying scenes spin on his head. Suddenly he felt connected to the people who experienced tragic death. But Jacobson felt unable to dispose of the thing. As a writer, he feels the truth must be delivered. Later, another test result showed the lampshade was made of beef fat. Of course, this conclusion does not stop the controversy, it actually extends it.